Recently, I received a summons to jury duty. I was very excited: I thought it would be a great opportunity to see the law in action and participate as a citizen. It was for a criminal trial that was estimated to last approximately 14 days. Alas, it was not to be so. Not because I wasn’t selected, but because I couldn’t even hope to be able to afford it in the first place. In the province of British Columbia, you are paid the accumulation of daily fees upon completion of jury duty. I would guess that a day in court is six to eight hours in length including a lunch (I say “guess” because I can’t find information on the Ministry of Justice website). It would also be reasonable to assume that I would be compensated with at least minimum wage ($10.25 per hour, average $71.75 per day) as I would not be attending my job during this time (“Under the Employment Standards Act, an employer is not obligated to pay you for lost wages incurred during jury duty” – jury duty FAQ). We all know minimum wage is barely enough to survive on (note that the 2013 living wage in Victoria, BC is $18.73 per hour – Community Council). $100 a day commencing on the 50th day of sitting. At that rate, for a 14 day trial (almost three weeks counting only business days), I would receive a grand total of $440… that doesn’t cover even half of what I pay for my home. Leaving me with a week to find money enough to complete my home payment, pay bills and buy food among other basic expenses. However, if you’re on EI, although you’re not technically available to work or look for work, you still receive benefits. Alberta: reasonable travel expenses, other expenses as supported by receipts. British Columbia: possible reimbursement for some expenses, such as childcare ($50 maximum); the sheriff will let the juror know what expenses will be reimbursed. Manitoba: expenses, as may be prescribed in the regulations. New Brunswick: may be paid compensation for meals and travel expenses. Newfoundland and Labrador: child care solely because of his or her having to serve on a jury. 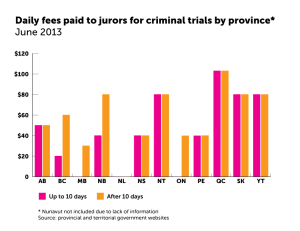 Nova Scotia: mileage at $0.20 per kilometre from the juror’s home to the Justice Centre and back. Northwest Territories: no expense coverage indicated. Ontario: daily travel expenses for those living outside the city in which the courthouse is located. Prince Edward Island: travel expenses. Québec: transportation (public transport or $0.43 per kilometre and parking), breakfast ($10.40), lunch ($14.30), dinner ($21.55), accommodation ($83 to $138 per night for hotels; $79 per night for other accommodations), care of dependents ($124 to $247 depending on the number of people). Saskatchewan: public transportation or use of a private vehicle, and accommodation and meal expenses as deemed reasonable by the sheriff. Yukon: (no additional compensation indicated). Jury duty in Québec, anyone? The conclusion I draw from this is that only those with disposable income are desired as jurors (Québec exepted), thereby excluding those of lower income brackets… Who are, you know, like, most people. Based on this information, it seems that the only way I can participate in the legal system is to (a) commit a crime and get caught, (b) sue someone or (c) change careers and get involved in the legal profession. Who’s with me? And for which one?